Short game to long game ratio is something that many players fail to think about when evaluating their golf games and more importantly their practice schedule. 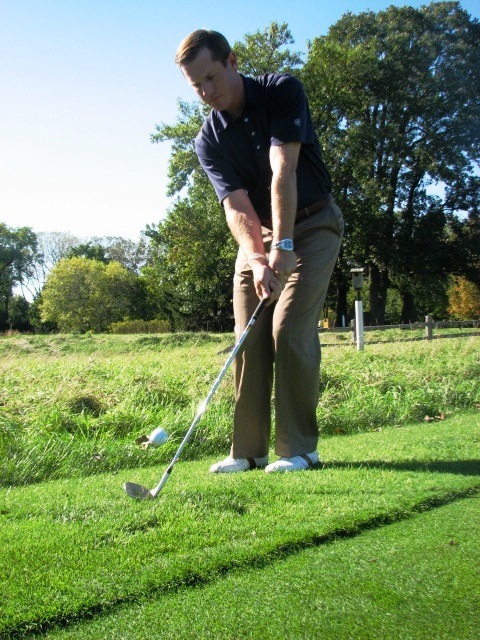 Typical practice sessions are after work or just before a around of golf, so even though there is not much time you need to maximize what time you do have. So, to do that you must know two things. *One, what is the weakest part of my game? *Two, what type of shots (ie. putts, chips, woods) you hit most during a round of golf? Lets think about this for a minute, when you play a round of golf there are 18 holes. 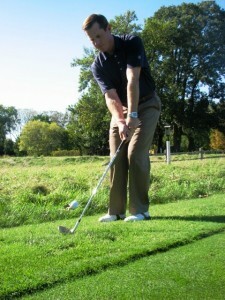 The National Golf Foundation reports that 74% of golfers don’t break the score of 90 on a regular basis. So, let give you the benefit of the doubt and say you shot 90 for the day. There are typically four par threes on a golf course, so that means you will typically hit your driver 14 times or 16% of the time during a round of golf. This will on average leave you a shot into the green that will require you to hit an iron or wood into the green. Since there are 12 par 4’s, 4 pars 5’s, and 4 par 3’s on average that would mean you will be required to hit a minimum of 28 iron/wood or 31% of your shots from the fairway or rough. So, you have hit 47% of your total shots and we have not talked about chipping or putting just yet. This means that roughly 48 shots are left for chipping and putting. The average player that shoots 90 might hit 5 greens in regulation, so there will be 13 chip shots from around the green. That in turn means we will have 35 putts for 18 holes or 1.94 putts per hole on average. This doesn’t leave much room for a 3 putt and it also means on average we should be 2 putting every hole and one put one of the holes. All this to shot a score of 90, so think about your goals and abilities and what it might take. Let’s go a step further and take our 18 full swing iron/wood shots and we assume that we hit every green in regulation, then we added an average of two putts per hole, 36. That gives us a score of 68, a great score. Where do the shots go? Since the best players on the PGA Tour only average hitting 12 greens per round that means we will have to do some chipping, pitching, and putting along the way. You can see that even the best players in the world on average have at least 6 chipping and pitching opportunities every time they step on the course due to missed greens. Now, let’s talk about the average player that may hit 6 greens in regulation and will have 12 opportunities to make par from off the green. If the player pars the 6 holes that they hit the green in regulation on and fails to get up and down on the other 12 greens that gets us to a score of 84. This means that the chipping and putting will account for at least 48 total shots or 57% of all the shots you hit on the golf course to shot that 84 and all this with out a three putt. Now, the player that focuses on their short game will on average get 50% of those up and down to save par and will hit 2 birdie putts per round. That would give us a score of 76, which every player that typically shots 90 would be happy to shoot. That is a drop of 14 shots without technically changing any aspect of your full swing or long game. As you can see it really doesn’t matter is you are talking about a Tour player or a 30 handicapper, it all come down to the short game of chipping and putting, because we all have to have a solid short game to improve our scores. I hope this helps you rationalize the short game and encourages you to really work on the finer points of your short game. Please contact me if you have any questions.